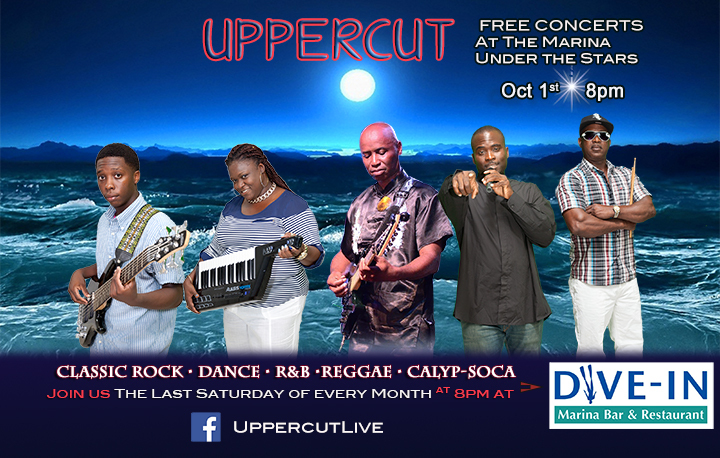 Freeport, Grand Bahama Island - The Free Concerts at The Marina series with UPPERCUT returns to the Dive In Marina Bar & Restaurant at UNEXSO Saturday, October 1st, 2016 jamming an energetic slew of hot new tunes as well as some old favorites, You won't want to miss this! The Uppercut monthly 'Concerts at the Marina under the stars with Uppercut' are all about providing unique musical experiences for those bored of the same old sh... Couple authentic LIVE music of a FULL BAND of great musicians along with tasty waterside dining and cocktails at the Dive In, and you've one heck of an awesome night out! Join Uppercut at the Dive In for an amazing evening with the band that everybody's talking about, Uppercut! Their eclectic blend of Classic Rock,Reggae, Rap, Contemporary, Disco, Blues, Calypsoca music is perfect to enjoy whilst sipping cocktails and enjoying succulent marina-side dining, overlooking the luxurious yachts at Port Lucaya. At the DIVE IN, customer friendly waiters, chefs and bartenders are at your beckon call. Mark your calendar with UPPERCUT, Saturday, October 1st, 2016 @ The Dive In. Showtime is 8pm. Reservations are suggested due to high volume, be sure to call (242) 373-1244 to book your seating or email rsvp@thebahamasweekly.com. This post contains highlights of a live recording of The Upper cut Band at Bahamas Air Sea Rescue (BASRA) annual Swim Race and Beach Party at Coral Beach in Freeport/ Lucaya on Grand Bahama Island. The Gala took place August 20th, 2016. The songs included are all cover tunes not composed by the band including; Cake by the Ocean, No Woman No Cry, Rapper's Delight, Maria Maria, Signed Sealed Delivered, Come Together.